This past year (being the 30th anniversary of the Big Thompson Canyon flash flood) brought the District a more normal flood season with 37 threat days, of which 27 days realized their potential by generating at least one heavy downpour. This statistic is in sharp contrast with the prior 4-year period of more drought-like conditions. While a few localized floods did catch the attention of the media, no major damaging flood occurred in the District in 2006. Our neighbors to the south in Douglas County were not as fortunate, having experienced a devastating flash flood in the area impacted by the 2002 Hayman Fire (see July 7 narrative). Last year’s issue of Flood Hazard News described the impact Hurricane Katrina had on disaster planning for this region. The 2006 annual Boulder Creek flood exercise was a testament to this. Efforts began early to prepare for what turned out to be the largest flash flood exercise ever held in Boulder. It should be noted that the community of Boulder, including the County and CU, have held annual flood exercises since the late 1970’s and have long recognized the threat posed by Boulder Creek. The exercise involved a Big Thompson-like flash flood scenario for Boulder Creek. The main event was preceded by a tabletop exercise; GIS support training; and other orientation and planning meetings. The April 18 exercise involved a fully operational emergency operations center (EOC) in which 136 people participated and 15 emergency support functions (ESF) were tested. In the “field” other related activities happened simultaneously, like moving 1900 Boulder High School students to upper floors, evacuating 200 patrons from the Boulder Public Library, vacating certain city buildings, simulating underwater rescues, establishing a backup EOC at CU, and testing response plans for area hospitals. At the EOC, a real-time storm/flood simulation permitted hands-on use of available technologies including radar, ALERT data displays, hydrologic model outputs, alarms, text messaging, paging, GIS inundation mapping and weather/flood messages from the NWS and HDR Engineering. Local news media were present, automated reverse-911 flood warning test calls were made, and warning sirens sounded. AMEC Earth and Environmental was contracted to help plan, develop and facilitate the exercise. Other consultants assisted with storm and flood simulations. Participants judged the overall outcome a success. Congratulations to everyone who contributed so much and made this experience so valuable. 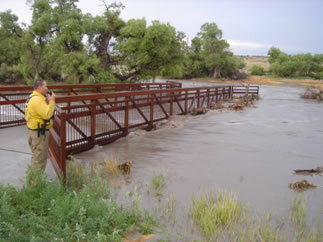 The flood safety information website http://floodsafety.com/colorado initiated in 2003 continued to evolve in 2006. This cooperative effort features flood videos, testimonials, descriptions of past floods, aerial photographs, flood inundation maps and a media kit for use by local newspapers and TV stations. A feature length video production for possible PBS broadcast is anticipated for 2007. The award-winning website designer and journalist, Marshall Frech, attracted the attention of The Weather Channel in their filming of the “It Can Happen Tomorrow” episode that features Boulder’s flash flood vulnerability. The program premiered in February. The District has been a CoCoRaHS sponsor since 2002. For information about how this valuable program performed during 2006, be sure to read the article written by Colorado’s State Climatologist, Nolan Doesken. To view a combineddisplay of CoCoRaHS and ALERT daily rainfall totals visit: www.lrcwe-data.com/CoCoRaHS.svg. EMWIN is a National Weather Service satellite downlink/rebroadcast system that stands for Emergency Managers Weather Information Network. It allows communities to develop their own unique applications including civil emergency messaging. This low-cost system became operational early in 2006. A public website that provides access to NWS text and graphical products will be available soon. More information about this project can be found at http://emwin.udfcd.org. Four new stations were added to the network in 2006: Sand Creek at Colfax (rain/stream); Boulder Creek at Broadway (stream); Boulder Creek at Green Ditch (stream); and the Marshall Test Site (rain). The Sand Creek station is part of Aurora’s Upper Sand Creek basin flood detection network expansion project. The Broadway and Green Ditch stations were installed by the City of Boulder Water Resources Department for compulsory water rights monitoring of hourly flows, as well as flood detection. The Marshall rain gage is located in Boulder County at NCAR’s (National Center for Atmospheric Research) field test site for precipitation gages. This will provide a unique opportunity to compare measurements from a standard ALERT rain gage with more sophisticated measuring devices and station configurations. By spring of 2007, a new stream gage will be operational on Lakewood Gulch at 10th Ave. in Denver. System expansion projects are also anticipated for Aurora, Parker and Douglas County. OneRain provided the 2006 field maintenance services for the 15th consecutive year. The Fort Collins engineering firm of Water and Earth Technologies provided monthly analysis of the District’s ALERT database for quality assurance and control. The ALERT system website continues to evolve. Be sure to read Chad Kudym’s article to discover what’s new. Since 1979, the District’s flash flood prediction program (a.k.a. F2P2) has provided flood threat notifications to District local governments from April 15 through September 15. HDR Engineering completed their sixth consecutive year of providing meteorological support in 2006. April, May and June passed with few noteworthy events. On June 21, an isolated storm in Douglas County west of Parker triggered the ALERT system’s first rainfall rate alarm of the year, but no flooding was reported. Three days later (June 24), a Saturday afternoon storm pelted parts of metro Denver with golf-ball-size hail. Most of the metro area receiving half an inch of rain while Boulder was hardest hit. The Boulder County Justice Center rain gage measured 2 inches over a 20-minute period. Hail-clogged street inlets caused some minor flooding to businesses. Described as one of the worst hailstorms in decades, the Boulder area also picked up its average precipitation for the month in just over 30 minutes. Heavy rainfall was also measured in Lakewood at Maple Grove Reservoir and at Chatfield Reservoir in Jefferson County. That covers the news for the first half of the 2006 flood season. By the end of June it was starting to look very much like another drought year for the region, but July changed that concern quickly. An early arrival of the Arizona monsoon occurred on July 2, causing a flash flood on Cherry Creek in the vicinity of Castlewood Canyon State Park in Douglas County. Messages were issued for the next 8 consecutive days, kicking-off the active second half of the flood season. This week of monsoon rains caused annual streamflow peaks at many ALERT gages in the mountains of Boulder and Jefferson Counties. Flash flood watches were issued by the NWS for July 3, 5, 8 and 9. Flash flood warnings were issued for July 2, 7 and 20, and August 1 and 3. The threat of heavy rainfall existed for 15 days in July, which is in sharp contrast to the previous July described as abnormally hot and dry with few thunderstorms. A remarkable flash flood on Cherry Creek was documented by the USGS with the assistance of a State Park Ranger. The USGS stream gage at Franktown recorded a 9-foot rise in less than 15 minutes. A post event analysis revealed that an isolated thunderstorm might have produced upwards of 7 inches in less than 2 hours. A CoCoRaHS observer near Franktown reported a 24-hour rainfall total of 4.28 inches. The flood washed out a number of small bridges in Douglas County downstream of Castlewood Canyon State Park. Because the area of storm was so small, the flood attenuated quickly causing no major problems in the District. Rate alarms also occurred at 3 ALERT rain gages in Aurora and 7 stream gages recorded annual peaks in Aurora, Littleton and Arapahoe County (seepeak flow table). Gun Club Road in Aurora was closed most of the evening between Alameda and Mississippi. Aurora was hit for the second consecutive day with minor street and intersection flooding. RTD’s light rail service in Denver was disrupted for about 20 minutes forcing crews to completely remove a train from its tracks. The heaviest rainfall occurred in Douglas and Elbert Counties and parts of Aurora. The largest rainfall report of 3.14 inches came from a CoCoRaHS observer east of Sedalia. Rate alarms occurred at 6 ALERT rain gages (4 in Aurora, 1 in downtown Denver and 1 near Sedalia in Douglas County). Eight Aurora stream gages recorded annual peaks with a record peak noted for the Toll Gate at 6th Ave. station. Independence Day was a weather-producer this year with nature contributing its own fire works. Denver and Arvada were the primary targets for heavy rainfall with many gages reporting more than an inch of rain. The Cherry Creek gage at Steele Street measured the greatest amount of 1.73 inches. Rate alarms occurred at 3 ALERT rain gages between 7:15 and 8:30 PM. The rainfall did not, however, prevent the anticipated celebrations from taking place. Five stream gages recorded annual peaks. This day resulted in Colorado’s worst flash flood disaster of 2006. Large portions of State Highway 67 in the West Creek area of Douglas County were destroyed. The West Creek watershed is in the burn area impacted the 2002 Hayman fire that consumed over 138,000 acres. Photos and videos of the flood damage were reminiscent of the deadly Big Thompson Canyon flash flood that occurred on July 31, 1976. Estimated losses exceeded $10 million. Heavy rainfall also fell over the Bear and Turkey Creek basins and at Highlands Ranch in northern Douglas County. No flooding was reported from these areas. Heavy rains near Jamestown in Boulder County prompted the NWS to issue a flash flood warning. This area was affected by the Overland Fire in 2003 and has had repeated problems with mudslides. Rainfall alarms occurred at 5 gages in this area. The heavy rains this day appeared to follow the C-470/E-470 corridor with amounts exceeding an inch at many locations. Aurora once again became the target for the highest totals, with one CoCoRaHS gage reporting 2.25 inches. Rate alarms occurred at 5 ALERT rain gages between 6:40 and 7:45 PM. Four stream gages recorded annual peaks. Leyden Creek experienced its largest flood in more than 25 years according to a Jefferson County official in charge of road repairs at Quaker Street where the creek overtopped the roadway by as much as 4 feet. Further upstream Leyden Road was also overtopped. The flood caused Leyden Lake to rise over 4 feet in just 4 hours. The spillway was not overtopped and no damages occurred downstream through Arvada. Improvements to the dam and spillway were completed by the District and the City of Arvada in 2001. The Upper Leyden rain gage measured 2.91 inches in less than 2 hours. Rate alarms occurred at 4 ALERT rain gages. Intense rainfall was also measured in the Lena Gulch basin. Multiple storms occurred during the evening hours causing the ALERT system to generate 11 rainfall alarms from 7 stations in Denver, Aurora and Golden between 8:15 and 10:40 PM. Annual peaks occurred at 8 stream gages on Harvard Gulch, Goldsmith Gulch, Westerly Creek and the South Platte River. This was another busy day for the ALERT system, but fortunately once again, no major damages were reported—just some nuisance flooding at a not-too-busy time of day. Consequently, this event attracted little media attention. “On 17th Avenue, a river runs through it”…is how the front-page photo was titled on the August 15 issue of the Rocky Mountain News. The storm that caused the downtown Denver flooding dropped its rain right between the ALERT rain gages. Radar was the primary real-time observation tool and the early threat notification was issued well ahead of the storm. The Rocky reported that about 1.6 inches of rain fell between 4:10 and 5:00 PM in the Congress Park neighborhood, while other parts of the metro area received no precipitation. One CoCoRaHS observer in the area measured 1.96 inches while nearby ALERT gages picked-up less than half an inch. This was probably the most remarkable bull’s eye street-flooder storm of the year. And once more, no major problems were reported. Denver was the primary target again with north Denver being the area hardest hit. Intense rainfall between 5 and 6 PM submerged a section of W. 38 Ave. at the railroad underpass near the Fox Street intersection. Public works crews responded quickly to this familiar flood hazard to make sure nobody fell victim to the deep floodwaters. A nearby CoCoRaHS observer reported 1.97 inches from this event. Goldsmith Gulch. The side channel detention basin at Iliff filled to a depth of 0.3 feet and the ALERT stream gage at this location measured its annual peak. More information about past storms and floods can be found on the bulletin board webpage at alert.udfcd.org.